Peter Coleman has been a member of the Federal Parliament (1981-87) and the New South Wales Parliament (1968-78). He is a writer/journalist and has been editor of The Bulletin and Quadrant. 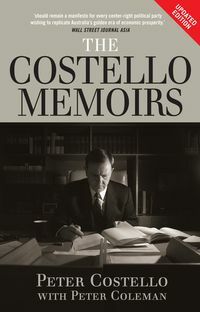 His many books include a study of the intellectuals in the Cold War, The Liberal Conspiracy: The Congress for Cultural Freedom and the Struggle for the Mind of Postwar Europe, and the autobiographical Memoirs of a Slow Learner. He was a foundation member of the Australian Council for the Arts (1968-73) and Chairman of the Australian Film and Television School (1971-73). He was Administrator of Norfolk Island (1979-81.) He is Peter Costello's father-in-law.